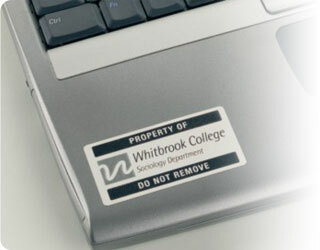 Need labels for your office property? This range of Avery® labels are great for placing on computers and other office equipment. You can also use them to speed up the annual stock-take. And there’s no need to pay external suppliers for printed labels as it’s so easy to create your own. Avery Durable Heavy Duty White Laser Labels ideal for pallets, contact details, sales and warning signs or instructions. A4 Size - White - Extra strong permanent adhesive. Avery Durable Heavy Duty White Laser Labels ideal for A6 size signs, product labels or instructions. 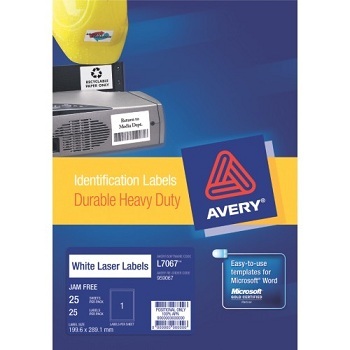 Avery Durable Heavy Duty White Laser Labels ideal for labelling products and as price labels. Avery Durable Heavy Duty Silver Laser Labels ideal for marking your electronic components, labelling products or brochures for sale and display, creating a stylish label for folders, shelves and more. A4 Size - Silver - Extra strong permanent adhesive.